It is only a forest. In the first place I met this painting in a book, thus it was fair to place a book in the painting. It owes its title to a protagonist of this novel, though the latter is only an alibi. For the first time there is no character in it. However, the painting is far from being anonymous. In front of the blank canvas, it's difficult to know were exactly we're aiming at. We need to write the pages, we have to work our way. We can learn a lot about ourselves by painting a forest. Les trois jours de salon on été pour moi-même palpitants et ponctués de magnifiques rencontres. Je suis ravi que nous ayons pu échanger à un moment. Oui, certaines toiles peuvent être acquises, je vous invite à m'envoyer un email avec les pièces qui vous intéressent, je vous donnerai les détails. Hello again, I think I am one of the slowest painters on the planet, but I have been getting there with my forest paintings. I have one to show you here: http://www.oilpaint.co.nz/the-two-trees/ that I am working on. The forest is very different in New Zealand, very messy and slightly like a jungle. I checked out the photos of your exhibition and it looked lovely. So many smiles. I hope the painting is going well. Oh wow! So lovely to visit your site and find this beautiful forest painting. Very inspirational for me. I am part way through painting a forest myself, although it has a figure in it. Tree trunks, bark, branches, moss and vines have been more fun to paint than anything I've ever painted before, so much room to play. My favourite part of your painting is the way the tree roots grow out underneath the path in intricate patterns. Also I love the mossy greens, and the way you have handled the sunlight filtering down through the trees and lighting up the forest floor, so perfectly done. 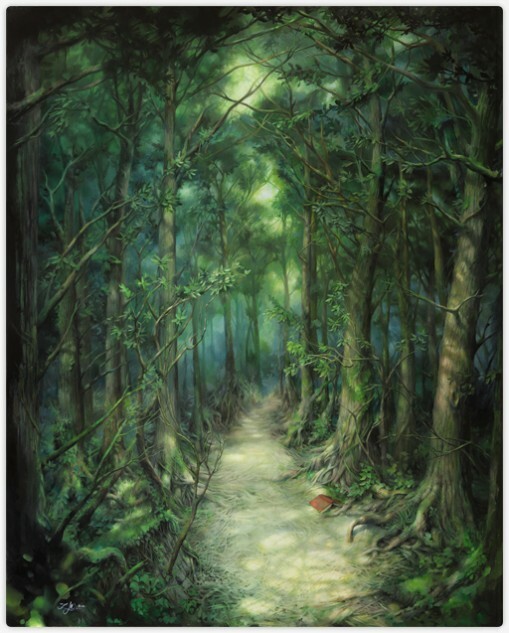 A warm welcome to the society of forest painters :) indeed, once assimilated the basics of perspective and light, the miscellany of organic elements is like realistic abstraction to paint. So much room to play, that's exactly what I thought when starting up the project! Figure painting is tougher. Glad you liked the sundrops on the floor; I was very excited at the way the one at the bottom of the second thumbnail could fool a viewer; one could swear there was a sunbeam falling down on the canvas :) Don't forget to show me your forest when it's done ! Et je crois que c'est ça qui permet à quiconque d'imaginer ce qu'il veut, du moins en rapport avec cette forêt. Vous nous offrez comme un support pour projeter ce que l'on veut y voir, un titre sur la couverture, une ombre parmi les branches; et n'est-ce pas ça la base de tout rêve? Se servir d'un tissu d'images et de souvenirs pour y découvrir ce qui se cache en nous et nos désirs les plus profonds? Je me répète avec mon commentaire sur dA, mais merci encore de nous offrir de tels bijoux oniriques! Oui c'est parfait! :) I started in March and finished in November, with long non-painting periods in between. hehe :) fish's hiding ! Or wait.. it's drawn on page 35.
magnifique tableau, qui donne envie de flaner dans cette foret peut etre enchantée! Merci Marjorie ! Tu es semble-t-il la première à tomber sur cette toile toute nouvelle !